Constructed of 1000d Cordura. Unique lateral loading system with 3 hidden internal compartments using drawstring partitions. Outside compartments hold standard helmet. No cumbersome top zippers and no bungees! 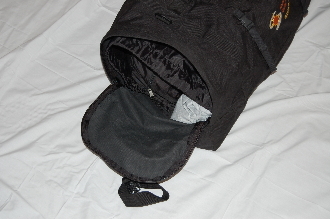 Bag sits neatly over rear seat or cargo plate and is fastened to the bike using 2" compression straps that weave underneath the hard bag support rails and top of the bag. Water resistant. Washable. 31"l x 15"h x 12"w. Fits just about every bike with hard bags.